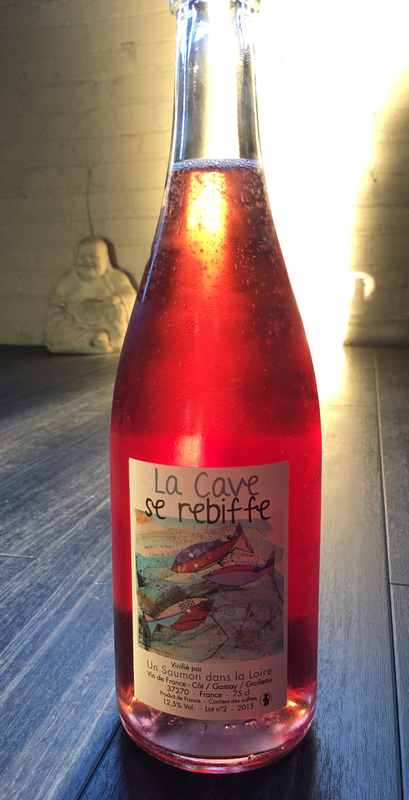 Winery: Progressive winemaker Frantz Saumon is the man behind the negociant label of “Un Saumon Dans la Loire,” or a “Salmon in the Loire”. His own small estate [6 hectares] located in Montlouis in the Loire, was established in 2002. Un Saumon Dans la Loire has allowed him to buy 3 to 4 hectares of additional grapes each year. He is known for his pure flavours, “always looking for clean wines and thriving for dryness”. His Petillant Naturels [Pét-Nat] are recognized as some of the best in the Loire region. Winemaking: Frantz Saumon has always practiced organic and biodynamic farming. He uses only indigenous yeasts for fermentation and never fines or filters. Wines are aged in a stainless steel tanks and wood barrels of different sizes. Tasting Notes: Brilliant cherry red in colour, with aromas of chocolate covered cherries dusted with crushed pink peppercorn. Cherry, blackberry, a slice of red apple, and dry minerals sprightly zip along on solid, frothy bubbles. Chocolate covered cherries return on the dry finish, along with a slight hint of white truffle. Elegant and cheery, fantastic on its own or a fun companion with a wide variety of dishes.